Using a selection of letters, essays, and speeches, Andrew Jackson vs. Henry Clay illustrates how the clashing perspectives of these two historical figures shaped and exemplified the major issues of national politics between the War of 1812 and the territorial crisis of 1850, the preservation of the union, federal commitments to banking, tariffs, internal improvements, and the egalitarian tone of national political culture. Harry L. Watson is professor of history at the University of North Carolina at Chapel Hill and director of its Center for the Study of the American South. He edits Southern Cultures, the Center’s quarterly journal. He has also published three scholarly books, numerous articles, and has edited two volumes of essays. His 1983 An Independent People: The Way We Lived in North Carolina, 1750-1820 was corecipient of the AHA's James Harvey Robinson Award. Watson's Liberty and Power: The Politics of Jacksonian America (1990), is considered the most cogent synthesis of Jacksonian politics in a generation of scholarship. 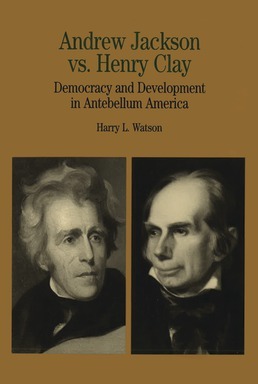 His most recent book is Andrew Jackson vs. Henry Clay: Democracy and Development in Antebellum America, in the Bedford Series in History and Culture. Watson has been a Woodrow Wilson Center Fellow, he lectures widely in the United States and abroad, and he is currently president of the Society for Historians of the Early American Republic.